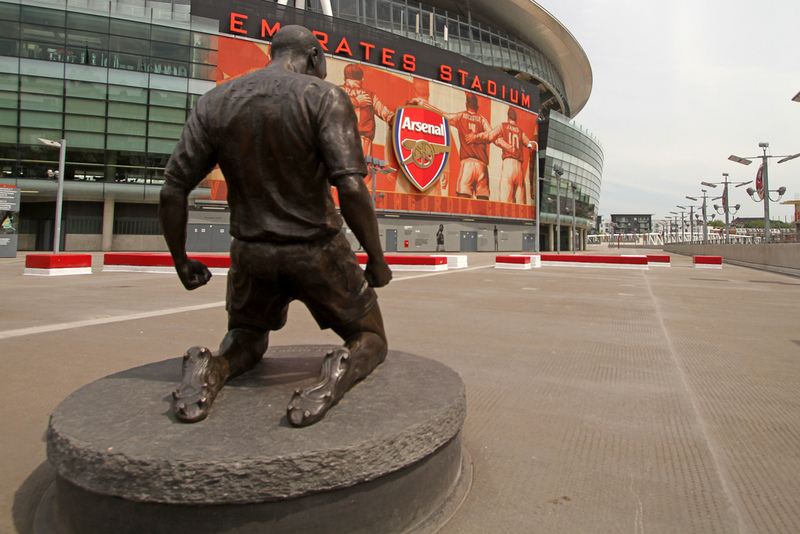 Those lucky enough to have a ticket to watch an Arsenal game or who are taking one of the popular stadium tours, can hardly fail to notice a statue outside the south-east corner of the Emirates of a footballer on his knees celebrating. It commemorates an Arsenal legend and the club’s all-time goal scorer, but this is not somebody from a distant era, barely remembered. Thierry Henry is only 40 years old, and, although he has been retired form professional football for nearly four years, and last pulled on an Arsenal shirt six years ago, he is still a familiar figure to millions, whether it be through his role as a football pundit for Sky Sports, or as assistant manager to Roberto Martinez during Belgium’s World Cup career. A World Cup winner with France in 1998, Henry played for two of the biggest sides in the world in the form of Juventus and Barcelona, as well as enjoying a successful spell towards the twilight of his career with New York Red Bulls. Yet it was during his time with Arsenal that Henry wrote his name into the history books, scoring 226 goals from 369 games, and helping the club win two Premier League titles and two FA Cups, as well as helping the team achieve the unique feat of going through the whole of the 2003 – 2004 “Invincibles” season undefeated. He was also runner-up in the Ballon d’Or and the FIFA World Player of the Year, was twice the PFA Players’ Player of the Year and three times the Football Writers’ Footballer of the Year, as well as being elected to the PFA Team of the Century. Yet when he arrived at Highbury in August 1999, after a disappointing spell in Italy, many expressed doubts about his ability to adapt to the quick and physical English game, criticism which seemed justified when he failed to score in his first eight games for the club. But then, in September of that year, on as a substitute against Southampton, Henry picked the ball up on the edge of the area with his back to goal, and scored with a glorious shot that gave the Gunners three precious points on the road. History was about to be rewritten. Not everything during his Arsenal career was an unsullied triumph for Henry. 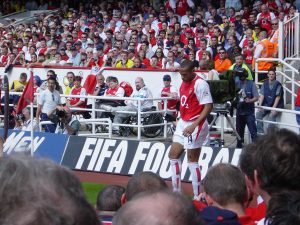 League titles were snatched away from Arsenal by Manchester United, and he was forced to miss their 2005 FA Cup victory over their bitterest rivals with an Achilles injury. However, the biggest disappointment came in 2006 when Arsenal reached the European Cup Final against Barcelona in Paris, having disposed, along the way of Real Madrid, with Henry scored a brilliant solo winner in the Bernabeu. Forced to play for the majority of the match with 10 men after goalkeeper Jens Lehmann was sent off, Arsenal nonetheless led through a Sol Campbell header, and Henry had two one-on-one opportunities with the Barcelona keeper, the sort of chance he would normally score in his sleep, to effectively put the tie to bed. Instead he missed them both, and the Catalans came back to win with two late goals. At the end of the following season Henry transferred to Barcelona for £20 million. Although he enjoyed a relatively successful career in Spain, winning the Champions League, La Liga twice and the Copa del Rey, towards the end of his stay there it was clear that his best days were behind him and he was allowed to leave for New York in July 2010. In January 2012, during the MLS off-season, Henry returned to Arsenal for a two month loan spell to provide cover for players who were absent at The African Cup of Nations. He made his second Arsenal debut as a substitute in a third-round FA Cup tie against Leeds United, and made an immediate impact, collecting a pass from Alex Song to score the winner, sparking a huge emotional reaction from the player, his manager and the packed stadium. He also scored on his last game on loan, a stoppage time winner away at Sunderland. 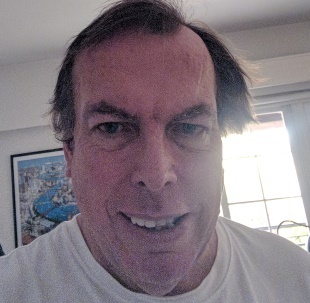 Henry enjoyed a very successful international career with France, winning 123 caps, and scoring 51 goals, which is a record, and ten more than the nearest contender Michel Platini. He was part of the squad that won the 1998 World Cup on home soil, although he did not feature in the final, and was an integral part of the team that followed that up with triumph in the European Championships, earning a man of the match award for his performance in the final against Italy. Despite these statistics, there remains a feeling that Henry never managed to reproduce his club form when wearing the blue jersey of France, and, as a result, he is less revered in his native country than he is in London N5. His reputation has also been sullied, certainly in Ireland, by the “Hand of Thierry Henry” incident which occurred in 2010 during a World Cup qualifying play-off clash. Drawn against the Republic of Ireland, the two teams were level on aggregate going into extra time in the second leg in Paris, with only seven minutes separating them from a penalty shoot-out to decide who would go to the World Cup finals in South Africa. That was when a free-kick found Henry running towards the back post where he deliberately controlled the ball with his hand twice before playing it across to William Gallas to score into an empty net. The referee missed the incident and the goal stood, much to the fury of the Irish players, officials and supporters. Protests to FIFA followed and calls for the match to be replayed which, in the end, amounted to nothing. 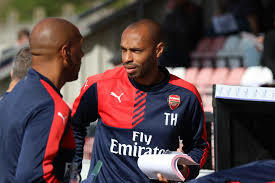 His renaissance owed much to his manager at Arsenal, Arsene Wenger, who converted Henry from a winger to a striker, giving him more responsibility as the spearhead of the attack, and the Frenchman never looked back. With a deceptively causal approach which saw him glide past opposing opponents, often with a devastating turn of pace, Henry was almost the complete player, able not only to finish moves, but also initiate them as well. He could score almost any type of goal, from long-range thunderbolts, to his trademark finish where he would open his body on the left-hand side and slide the ball past the keeper. He rarely scored with his head – but that was not his game. And he was not just a goal scorer either – his Premier League record with Arsenal included 74 assists for other players. “And then there is the magnificent Thierry Henry – someone who has blistering pace and is unbelievable when he is finishing at his best. “It’s really unexplainable that a guy who is not only interested in scoring goals should score so many. He’ll not only have a place in the history of Arsenal but in the history of football. “There’s a difference between skills and functional skills. Thierry’s skills were perfectly functional. There was something behind every movement: to get a strike, receive a pass. “I just want to thank him for the great moments he gave to all of us. “What happened to Thierry Henry was that he wanted to be the best player every single day of his life. In training, the FA Cup, Premier League, League Cup and the Champions League.